The knee was feeling better, and his explanation of what had happened to the patella after being crunched in my first fight had made me feel a hell of a lot better about it. The most troubling aches and pains in sports are always the mysterious ones. I also had a foggy feeling in my head, as if my skull was packed with cotton wool, so densely I could feel it pushing against the back of my eyeballs. Most conversations sounded as if the speaker was in another room, or talking to me through a closed door. He probably wasn’t the person to ask, but I was there, so I thought I might as well. “Let me put it to you like this,” said Gary. “We had a player at Collingwood, young guy, twenty-one, who was concussed during a game. Then, he started getting mystery headaches. We don’t know why; for no reason. I had enjoyed my first fight and intended to have many more. For some reason unbeknownst even to me, I was willing to throw over work, girls and almost everything else to trade punches for hours every day in a dirty gym an hour’s drive from my house. If I had been told fighting would have given me cancer, I probably would have continued. And from Gary’s experience with athletes, he understood that better than I did. He left me to answer my own question. I started fighting in 2006. In the course of an eight-year career, I had a total of seven kickboxing fights and one amateur boxing fight. While most would consider this to be so little experience as to be almost discountable, I trained for a period of close to ten years and, in that time, did a lot of what I would call heavy sparring. Like many fighters who are serious about their sport, I was willing to engage in a sparring session as if it was a fight, and the real distinction between those sessions and the fights themselves was the presence of a paying audience. That said, I suffered dozens of broken bones and at least ten concussions. One of the worst incidents occurred when I was knocked down while sparring at the Fighter’s Factory in Blackburn on a Tuesday and went to see Nick Cave that night. I stood in front of the stage and remember the concert now as if it was a dream that took place in the building next door, the sound was so muffled and blunted. I went back to sparring on Thursday and was knocked down again. I was so messed up afterwards, my friends told me I was repeating myself when I spoke. Given that I hadn’t realized, I thought I had better go and get a CAT scan. Afterwards, the doctor told me to retire. I took his advice until I received a call out of the blue a few months later to fly to Holland and trial at Golden Glory, the strongest kickboxing gym in the world at that time. Upon arrival, Alistair Overeem, Gokhan Saki, Errol Zimmerman, Raul Catinas and Benjey Zimmerman would regularly batter me around like a bouy in Port Philip Bay. Calmly presiding over all this was Ramon Dekkers, veteran of over one hundred and eighty fights that were so savage, they defined a previously unknown and obscure Oriental sport in the Western consciousness as a unique combination of elegance and brutality, more unique and electrifying than anything seen before. After a three-month stay, I decided to quit Golden Glory. Some nights I returned from training almost unable to see. One night, I looked out the lounge room window into the street and all the colours were flowing outside the lines, as if the boundaries that discreetly held them had collapsed and the whole world was bleeding over itself in red and green and orange. I struggled to remember things; I’d lose my house keys three times a day. 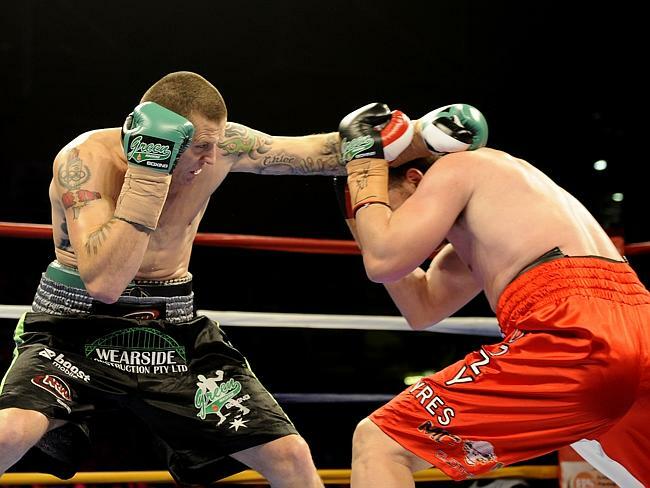 When I returned to Australia, I had another two fights. If I wasn’t a fighter, then who was I? Then, in my last fight, I destroyed my ankle. I decided not to have it surgically repaired, because if I didn’t, the injury would force me to retire. That was in 2009. The reason this is relevant is because I didn’t hear anything about chronic traumatic encephalopathy until after I had retired, somewhere around 2012. I saw a program on the ABC’s Four Corners about head injury in sports, mainly AFL football and rugby. I was reminded of Gary’s comments about head injury. These were spots where head injury was incidental. 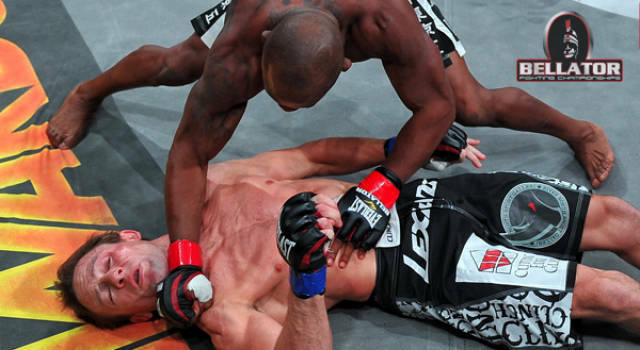 In combat sports, head injury is the point. The platform for the Four Corners program was research that had been gathering momentum in the United States over the previous decade. In the early 2000s, Dr Bennet Omalu investigated the case of NFL great, Mike Webster. After retiring from football, Webster suffered from dementia, depression and amnesia. He lived out of his car and occasionally slept in train stations until he died of a heart attack at the age of fifty. Chronic traumatic encephalopathy, or CTE, is early-onset Alzheimer’s disease. People afflicted by the disease initially suffer from deterioration in attention span, disorientation, dizziness and headaches. These preliminary symptoms give way to memory loss, erratic behaviour, irritability and poor judgment. Finally, in the advanced stages, sufferers are given to tremors, vertigo, deafness, slurred speech and suicidal impulses. Derek Boogaard, a former enforcer in the National Hockey League, died of a heart attack bought on by a combination of prescription pain-killers and alcohol in 2011. At six foot eight and over one hundred and twenty kilograms, the introverted and shy Boogaard struggled to develop and maintain the skills to play elite level hockey, but discovered he had an exceptional ability to scrap. While fighting on the ice is punished, it is viewed as an integral part of the game by both athletes and spectators alike. Players like Boogaard exist primarily on the pretext of their prowess as fighters. After his death, Boogaard’s family was approached by the Bedford V.A. Medical Center in Massachusetts to donate Derek’s brain for research. Upon examination, Boogaard was discovered to have had CTE. Within that six-month period, two other NHL enforcers also died of suicide. Studies conducted in the wake of the recent suicide of pro BMX rider, Dave Mirra, have concluded that people who experience mild traumatic brain injury, termed concussion, are four times more likely to die by suicide. There is also an established scientific connection with compulsive behaviour, such as gambling and drug addiction. The worst part of the very bad news is that the symptoms take between eight and ten years to emerge and there is no way to diagnose CTE without dissecting the brain post-mortem. This means I have three years to go. MMA gloves are four ounces, while a boxing glove weighs ten. Certainly, the boxing glove means a longer bout with greater potential for head injury, but anyone who has watched a UFC card has seen a hell of a lot of cuts and many a broken facial bone. Similarly, hockey fights are without gloves and, like a street fight, rarely involve more than one clean hit. 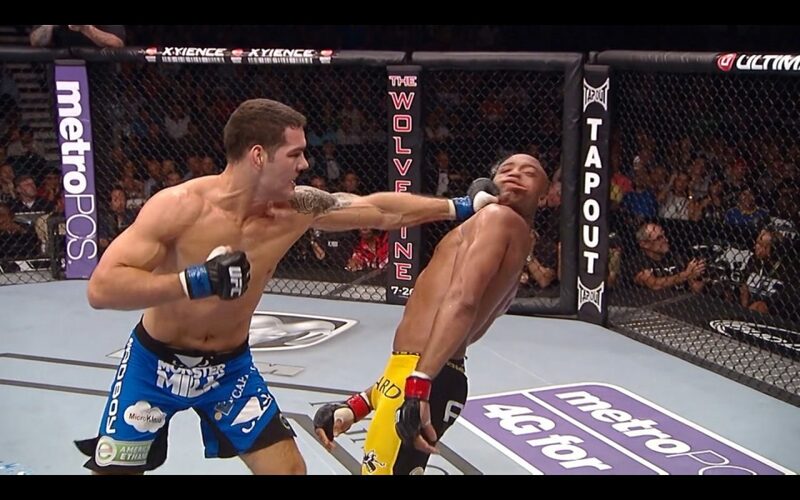 The other thing to observe is, the UFC struggles to maintain its stars. Most of them come, rapidly establish themselves and disappear suddenly, their absence cloaked by an ambiguous silence. Of the organization’s brightest stars, Ronda Rousey, probably made the biggest splash in the community outside the octagon. 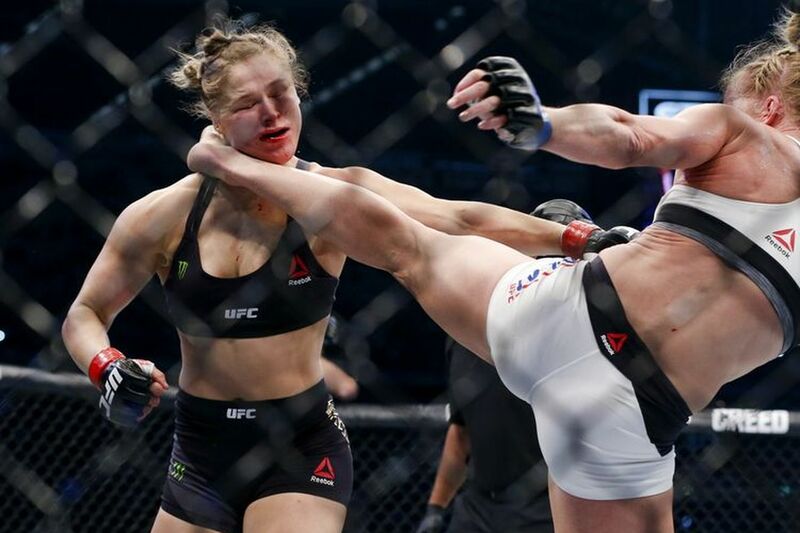 She is as remarkable now for the grotesque public outpouring of scorn, invective and vitriol in the wake of her loss to Holly Holm as she was for her complete dominance in her weight class. Ronda Rousey spoke about experiencing suicidal feelings on the Ellen Degeneres show, something it is likely she has a genetic predisposition towards, given that both her father and grandfather died by suicide. Many people derided her honesty as weakness and cowardice. The list of former fighters who vanish down the sinkhole of obscurity is vast. In fact, the phrase dementia pugilistica was the term originally used by doctors to describe what is now known as chronic traumatic encephalopathy. Fighters like Paul Briggs, world Thai Boxing champion and legitimate contender for the light-heavyweight world championship, has a past chequered with drug abuse and depression, all of which he detailed in his autobiography, Heart, Soul, Fire. His intention with the book was to change the way men spoke about depression and its descendents, drug abuse and violence, by speaking candidly himself, using his achievements as a fighter as the platform to do so. The wider public remembers him, not for his achievements as a fighter or stance on male issues, but for the one-punch knockout he suffered against Danny Green. The internet is ablaze with trolls who claim Briggs took a dive, berating him for his cowardice. It seems his largely anonymous detractors are wilfully ignoring the far larger shadows that have gathered in the background, such as the fact that the New South Wales Professional Combat Sports Commission refused to sanction the bout, given Briggs’ medical condition. “I just hope it doesn’t get to Paul and he does something silly,” said Johnny Lewis, who trained Briggs before the 34-year-old was forced to retire in 2007. “I hope he is able to move on. That is why I didn’t think it was a good idea for him to be part of this fiasco. The debate surrounding CTE has become a balance beam with dedicated fans, fighters and trainers at one end, vigorously denying the symptoms and outcomes that are destroying its best and brightest. At the other is a public who has no understanding or appreciation of blood sports, something for which (we believe) they are crucially impoverished. Surely there is a middle ground where medical research can be used to protect the men and women who step into the canvas crucible of skill and courage. The question is, do we really want to see our heroes broken and destroyed?